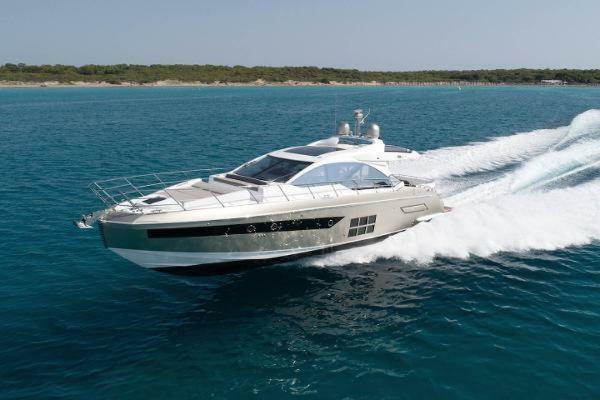 Azimut S6 is the second model in the new S generation sports range from Azimut Yachts. Carbon plays the lead role, representing another milestone in the shipyard's pioneering research and development work. The S Collection blends a sporty look with elegance thanks to innovative high-tech solutions and high performance materials for desirable, technological yachts. 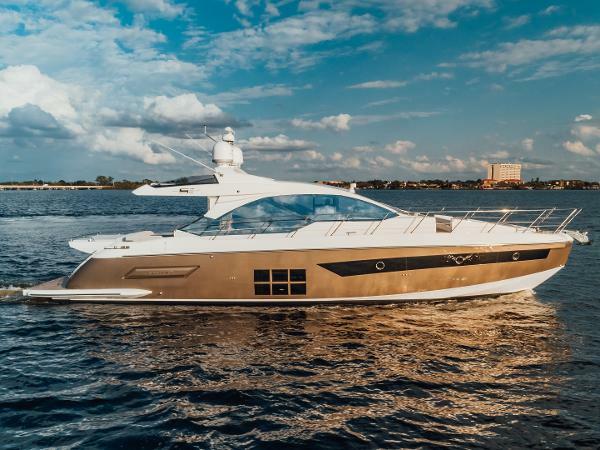 The stylistic high point of the collection is the dynamic bow cap while aboard, the huge open spaces create a sense of constant dialogue between the interior and exterior for unrivaled comfort and luxury. They say technology opens up new horizons and thatʼs certainly the case for the new S6. 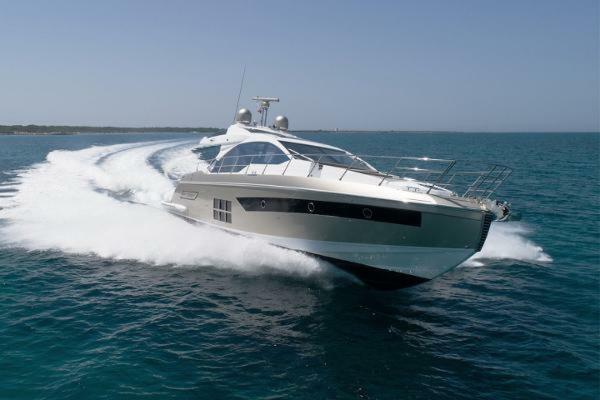 The use of carbon fiber and a propulsion system featuring three Volvo IPS units mean you can have everything you've always desired from a classy sports motor yacht, without compromising on comfort: a huge living space split between indoor and outdoor areas, three roomy cabins and a garage big enough for a 3.3-meter (10ʼ 10ʼʼ) jet tender. Because there are times when you can, in fact, have everything. 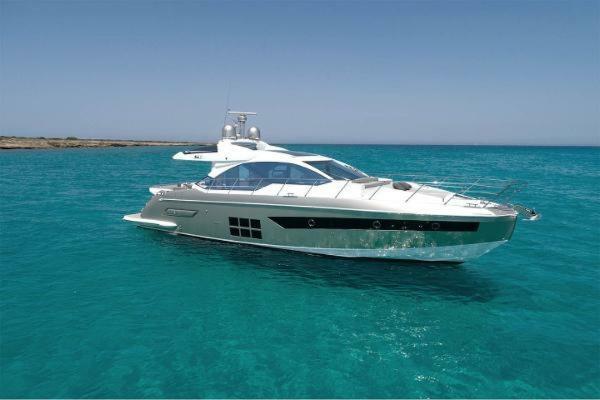 2020 Azimut AZS6 - Azimut's New Superstar- Triple Volvo D8 IPS 700s, SeaKeeper Gyro Stabilizer, Three Staterooms, Tender Garage in Beautiful Miami Silver Hull with Luxurious Platino Interior. 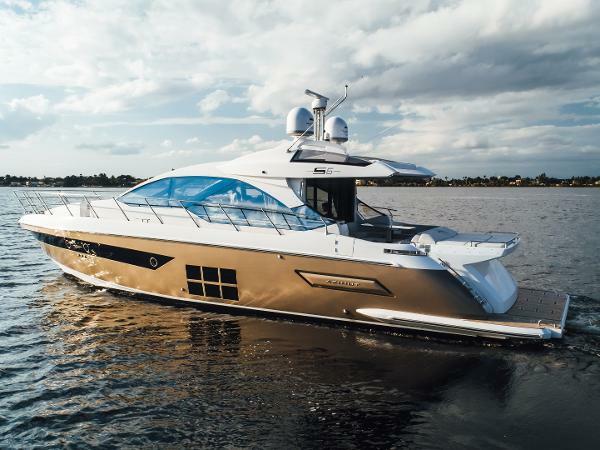 Factory Options to include: Complete AV Package with Dual Painted DSS Domes, Bimini on Bow, Bow Sofa and All Exterior Cushions in Batyline Fabric, Central Vacuum, 2 Cockpit Chairs, Cockpit Enclosure, Cockpit Docking Station with Joystick and Thruster Controls, Cockpit Wetbar with Sink, Icemaker and BBQ, Co-Pilot Seat at Helm, Crew Cabin with AC at bow, Drawer Chest with Armchair in Master Cabin, Refrigerator in Cockpit, Skyhook Dynamic Positioning System, Electric Awning for aft cockpit, Electric Shade for Salon Sunroof, Fabric Curtains in cabins and salon, Flagpole, Galley Top in Quartz, Glass Panel upgrade in Salon Sunroof, Glenndenning Cablemaster, Head Tops in Marble, Luxury Lighting Package in Salon and VIP Cabin, Mirrors in VIP and Guest closets, Painted Hull and Gunwale, Raymarine AIS700 System, Top Line Raymarine Platinum Navigation Package, Raymarine Thermal Camera M 232, Raymarine Videocaneras CAM200IP, Safe in master cabin, Salon Table with High/Low Mechanism, SeaKeeepr Gyro Stabilizer, Set of Linens for all cabins and crew cabin, Spotlights in cockpit, Stainless Steel Anchor, Teak on sidedecks, Hidden Telescoping Gangway, Toilet with Bidet Feature Faucet in master head, USB Socket, Washer/Dryer Combo Unit, Wooden Floor in sakon and lobby stairs, Auto Dynamic Trim with Volvo Interceptors, Advanced Package (Dual Racor Filters on main engines, Electric Mooring Winches in cockpit, Water maker Predisposition, Chain Counter at main helm, Cockpit Table, External Covers package and Closure Curtain for garage, Hauling Launching System for tender -tender not included, Custom Décor Upgrade, Miele Appliances, Teak on Swiveling swim platform) and Azimut 3 year Peace of Mind Warranty. Arriving soon. 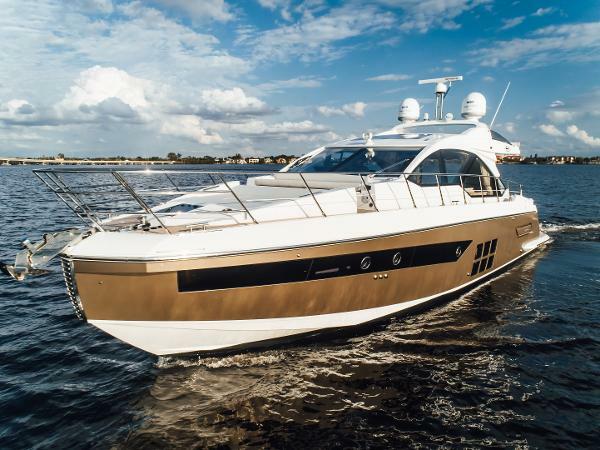 Call the MarineMax Huntington, NY office for more details, arrival date and appointment!